Girls Sz 8. This model is marked sz 6x-7. Children's Place sizing is pretty spot-on! Double-lined Poly Satin/ Tulle, pleated. Children's Place. I do this to keep item-costs down for you. Dorissa International Nicole Girls 6 Green Velvet Dress/purse Gold Trim Vintage. Condition is Pre-owned. Shipped with USPS Priority Mail. Beautiful green velvet dress and purse with gold trim, lined, zipper back closure. Large bow to back hooks on and off to open zipper. No rips or stains noted. Measures approx 12” from underarm to underarm and 27” from shoulder to hem. Comes from smoke and pet free home. Please see pictures for further details. Thank you for looking! Grosgrain ribbon at waist. 98% cotton velvet / 2% spandex. color: black with white and red floral pattern. size: 8 girls. 28" overall length. 13" at ribbon area (waist) laid flat across. two side pockets. DOLLCAKE Oh So Girly Dear Charlotte Dress size 3 NWOT. Shipped with USPS Priority Mail. 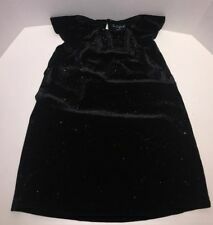 Hanna Andersson size 140 girls velvet dress with stretch. 29" Length. 17" Bust pit to pit. High-end expensive designer dress by Isabel Garreton in size 6 years. Gorgeous rich royal blue velvet dress with beautiful flower waistband, attached crinoline slip for princess pouf with bow in back, a must! 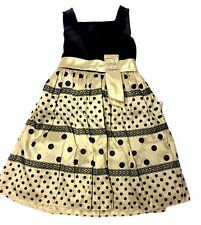 Black Holiday Velvet Polka-Dot Girls Dress (See Measurements) Excellent!! This fully lined polka-dot flocked dress features a velvet sash like waist with bow and tie-back. Bubble skirt with sleeveless cross-over front and with invisible zip-back. 57% Polyester / 43% Nylon. NWOT SUGAR PLUM Girls Size 10 2 Piece Dress Set. Red Calf Length Sleeveless Dress w/Zippered Back. Pleated Front & Back. Full Skirt w/Black Netting Around Bottom of Underskirt, Red Lining. Short Cropped Bolero Style Black Velvet Jacket w/Single Button Loop Closure at Neck.Very Dressy. Would be great for halloHall. Waist: 26". Lularoe Elegant Black dress with rainbow colored sparkle star Pattern. One of the most beautiful LuLaRoe prints! Soft velvet Scarlett. Size 8 Kids Scarlett just like the Carly Dress! Very cute Swea Pea & Lilli girl's size 6 black and red holiday dress in good condition. There is a tiny tag hole on the frontof the sash, see photos. From a smoke-free home. Lovely Vintage SIMI girls dress size 6x. It is a black and ivory houndstooth print with a sailer style velvet collar & accent buttons. It has cuffed long sleeves with a full skirt and zips up the back. It is very well made and a heavy fabric. Excellent condition! The red bow on the front needs to be unpinned (it is safety pinned on) and retied as it is a bit lopsided. I’m not great at bow tying so I left it as is. It is sold as is so please ask any questions prior to purchase. Thanks for looking! Because it is heavy I chose the priority flat rate price. If I can send it first class for less, I will do so and issue a credit for the difference. New TRISH SCULLY Pink Gianna dress velvet floor length one shoulder girls 12. Shipped with USPS Priority Mail. NEW with tags Size 12 Crushed velvet in pink, fully lined, one shoulder , side invisible zip. ***NO BELT INCLUDED ***add your own ribbon or to match your wedding or event Armpit to armpit 15” across Length 47” Very nice dress! Crown & Ivy Little Girl's Pink Velvet & Plaid Fit & Flare Fanciful Dress-Size-5-Pink & Navy Blue. Polyester, Lurex & Spandex. Charming dress has a solid pink velvet upper bodice with a round neckline and short sleeves. Item has been Gently Used & is in Great Condition! As pictured, there is a very minor stain on the back left side of the dress.barely noticeable, especially when wearing Shrug. Girls HANNA ANDERSSON Dress Size 120 6-6x-7 - Church dress, worn only a few times - Black, cream, and red plaid, w/ black velvet collar and trim at arms and bottom hemline - Smocked on front bodice, with pretty embroidered flowers - Zips up back bodice, w/ black velvet tie to make a bow - Condition is Pre-owned, excellent condition no stains, holes or rips etc. Found one very tiny snag on back of right shoulder as seen in closeup photo Free Shipping with USPS First Class Package. Novelty black velvet & jewelry trim. Cardigan is 95% polyester & 5% spandex; Dress is 100% polyester. Beautiful red dress has an red velvet upper bodice with a round neckline and long sleeves. Skirt is lined and has a ruffled tulle underlay creating a fuller tutu. Ruffled underlay has finished edges in matching plaid and drapes just past the hemline for a nice finishing touch. Girls Pink Dress w/Black Velvet top & lace overlay. Junior Size 7,8 & 10. Girl'sPink/Magenta Satin Sleeveless Pullover Dress with Black velvet top and black Bottom nylon Lace overlay with designs. Black back tie and waist band. No label was cut off. 92% Poly 8% Spandex. Embellished on front with white pearl beads. Black velvet 100% cotton. I will do everything I can, within reason, to resolve the problem as quickly as possible. 15.5" armpit to armpit, 33" long top of shoulder to bottom of dress. Chasing Fireflies. Beautifully made tutu dress. Christmas Fairy Dress. Looks great with your little ones favorite fairy wings. DRESS ONLY. Lots of layers of soft & glittery tulle. Classic “ballerina” silhouette dressed up with an intricate silver glitter design finished with a scalloped tulle hem. Polyester & Spandex. Gorgeous teal dress with glittering teal blue sparkles floating throughout velvet upper bodice. Round neckline. Open circular back with a bow knot across top. Waistline boasts little clusters of three rhinestones across front. Beautiful black velvet dress from Hanna Andersson. Size 110 - might fit 4-6 years. Embroidered flower/heart cutouts with red slip underneath. Back zipper. LABEL/MARKINGS:Hanna Andersson. MARKED SIZE:110cm - might fit 4-6 years per Hanna Andersson size chart. GIRLS Size 14. Very Gently worn. Machine Washable, Pull Over dress. Very comfortable for a young girl. Hurry before it's gone! We will do our the best to make you the best dress and provide you the best service. Polyester & Spandex. Elegant black velvet dress with a squared-off neckline accented in silver and black sequins which extend on down to sleeveless armholes. Tank top style shoulders. Pleats off black and silver sequins for added decoration. Dress from the Mother & Child collection features red tartan plaid, black velvet collar and covered buttons. Styled with slightly puffed sleeves and sash tie in back, so beautiful. Size 7 Years. MADE IN THE UK. It is in great used condition. The flowers and lace bows were added with a safety pin, so they can be removed if you'd like. Please see pictures for more details. Keep in mind the colors may be off due to lighting. The measurements are: armpit to armpit 13.5 inches, and length 29 inches. Thanks for your interest. Don't forget to check out our other listings. Items of similar style/brand are added weekly.